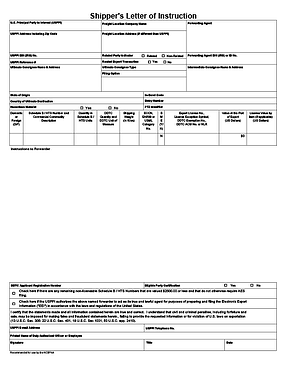 Shipper's Letter of Instruction forms in the formats you need. WHICH SHIPPER'S LETTER OF INSTRUCTION DO YOU NEED? Pick the one you need. They're all free for you to use. A Shipper’s Letter of Instruction (SLI) serves a very important function. 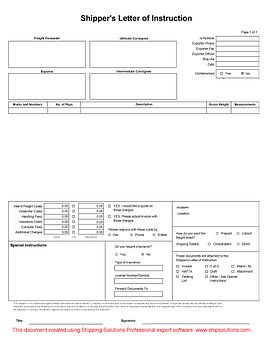 An exporter uses the form to convey transportation and documentation instructions to his or her agent, usually an international freight forwarder. In addition, the SLI typically provides a limited power of attorney to the forwarding agent for arranging transportation of the goods and, in some cases, filing the Electronic Export Information (EEI) to the Automated Export System (AES). 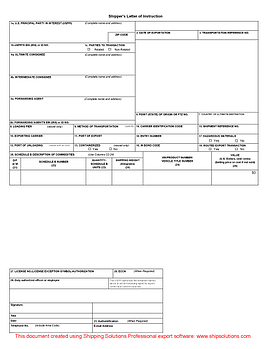 While a standard Shipper’s Letter of Instruction (see above) provides transportation and documentation instructions to a freight forwarder, it does not typically include specific line-item level product information that would allow the forwarder to file through the Automated Export System (AES). The National Customs Broker & Freight Forwarders Association of America (NCBFAA) has issued a model SLI that includes the level of detail required to file through AES including the additional data fields required by changes to the Foreign Trade Regulations that went into effect in April 2014. Traditional versions of the Shipper’s Letter of Instruction (SLI) allow an exporter to provide transportation and documentary instructions to his or her freight forwarder, but they do not typically include the additional information required to authorize and allow a forwarder to transmit Electronic Export Information through the Automated Export System (AES). Many exporters rely on a version of the SLI modeled on the old Shipper’s Export Declaration (SED) to provide this added detail to their forwarder. This version of the SLI in SED format has been updated to include the new data fields required by changes to the Foreign Trade Regulations that went into effect in April 2014.